This is a chapter from the rare 1939 book, The Case for Germany, which gives the view of National Socialist Germany that the author, a Scottish scholar, developed during his time inside Hitler’s Third Reich. Far from being the sort of hateful diatribe that was the common British judgement in those days, this book gives an insightful overview of National Socialism and of the domestic and foreign-political state of Germany less than 100 days before the outbreak of World War Two. IT HAS OFTEN been said here of the Führer that he was “only a house painter” or that he had “no education”, and the general tendency of opinion in England is that he was not a public school man and therefore is not much good. This attitude shows not only a regrettable snobbishness, but a total ignorance of the origin of so many great men. It is an error which we in Scotland are not likely to fall into, as so many of our famous Scotsmen have come from a similar stock, and have had a similar upbringing and education to that of the Führer. In the district of Waldviertel, lives a race of peasants who, in spite of having been part of the Austrian Empire, still speak the Bavarian dialect, and have clung fiercely to their traditions and racial independance. In 1672 a son was born to two of these peasants who bore the name of Stephan Hitler. His descendants lived on in the same district, until Alois Hitler, the Führer’s father, determined to see the world, and set off on foot for Vienna. He became a Customs official, but love of the soil was strong in him, and he soon bought a farm in the beautiful district where the Inn joins the Danube, where he established his family, and to which he went on his retirement to take up again the life of a farmer which had been led by his ancestors. As a boy his desire was to be an artist. On the death of his parents he went to Vienna with a few coins in his pocket taking his portfolio of drawings with which he hoped to gain entrance to the Vienna art school. “You will never be a painter”, said the Professor who glanced through his drawings, “but you show some talent for architecture”. An interesting prophesy for the future of the boy who was to superintend the rebuilding of Berlin. Rejected as a pupil both at the school of art and architecture, he found himself alone in Vienna with only a few coins between him and starvation. Building was going on everywhere and he found employment as a builder’s labourer: the boy of 18 entering on a life of desperate poverty learnt to know all that was most sordid and cruel in the life of a great city. For long his only home was the corner of a cellar which he shared with other workmen. His fellow workmen were all followers of Karl Marx, and endless discussions went on in which young Hitler joined. He became convinced that the Socialists and Communists were on the wrong lines, refused to join the trade union and for this refusal suffered an early martyrdom, — he had no sooner got a job than his fellow workmen had him dismissed. Finding it impossible to earn his living as a labourer unless he accepted the teaching of Karl Marx, he managed to pick up a scanty living by painting and selling cards. Many of his sketches made at this time survive, and show considerable artistic talent. After a time he migrated from Vienna to Munich and found a lodging with a small working tailor’s family. He continued to earn a small pittance by his painted cards, and began to devour all the books he could get out of the public library on history and politics. The tailor and his family have always remained his good friends, and have the pleasantest recollection of the courteous young Austrian who was adored by the children and made his good landlady anxious for his health by his omniverous reading on history and politics, which often continued through the night. He denied himself bread in order to have the means to visit the theatre, especially the great works of Wagner whom he revered and still reveres today. One night he read a pamphlet, which had been given him at a meeting, by a workman called Anton Drexler, and realised that here at last was someone who was thinking along the right lines. Next evening he went to a meeting of this “Deutsche Arbeiterpartei”, a group of seven men with only 7.50 marks for funds, which was later to emerge as the National Socialist Party and sweep the whole of Germany. Hitler inevitably became their leader and convinced them that the only chance of success was to hold public meetings. One of their first modest ventures was a meeting in the Munich Hofbräukeller, which held about 130 people. Hitler rose to address them and laid before them his whole plan for regenerating Germany. As he spoke the audience became wildly enthusiastic. He realised that he had the gift of oratory, and that by the use of this gift he could rouse Germany to action. The audience went out to spread everywhere the name of Hitler. Their future meetings grew larger and funds began to flow into the empty cash box. The Socialists became alarmed and decided to break up Hitler’s meetings by physical violence; but he had foreseen this development and had called to him a handful of his old comrades of the battlefield and organised them as a militant body whom he called his Storm Troopers. In November 1921 he decided to hold a great mass demonstration to test the real strength of the new movement, and if it succeeded to spread his organisation over the whole Reich. The Socialists determined that it should fail, and arranged to make an attack at the meeting which would smash the movement once and for all. The audience sat at little tables and refreshed themselves with beer while listening to the speaker. In Munich these beer mugs are heavy earthenware vessels. While Hitler was speaking the Socialists had been storing the empty mugs under their tables for ammunition, and at a given signal began hurling them at the heads of the audience and at Hitler who was standing on a table. During the rain of mugs Hitler never moved, and by some miracle was not hit. His Storm Troopers went promptly into action and though they were unarmed and their opponents had knives and other ugly weapons and greatly outnumbered them, the Storm Troopers after a desperate fight drove them out of the meeting. The scene was one of the wildest description and the hall was littered with broken mugs and smashed tables and chairs. 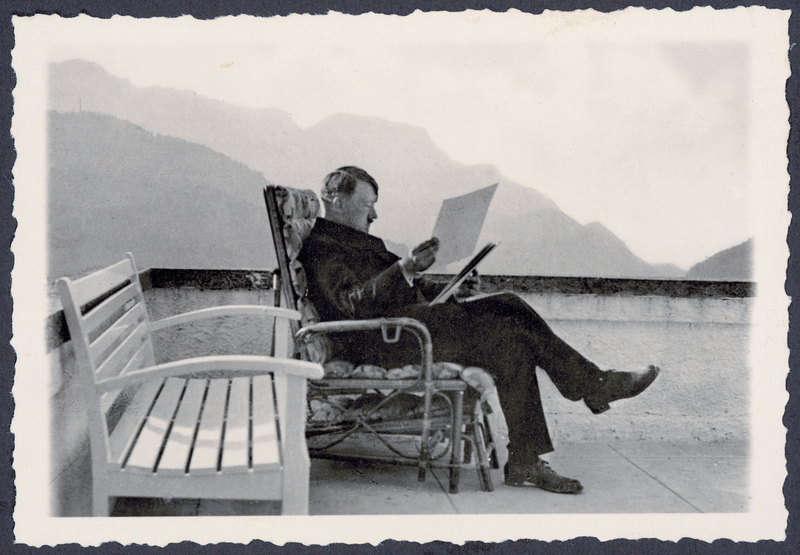 Hitler calmly continued his speech where he had left off as if nothing had happened. Henceforth the Storm Troopers were known as “Storm Detachment” (Sturm Abteilung or SA.). While the Nazi movement was spreading through Bavaria, the Bavarians were getting more and more dissatisfied with the central government in Berlin, and a movement was spreading to separate Bavaria from the Republic. The Bavarian Minister von Knilling appointed Herr von Kahr as Commissar with almost absolute power. Herr von Kahr broke off relations with Berlin and was joined in his revolt by the heads of the army and the police in Bavaria. There was talk of a march on Berlin, while Ebert was considering the possibility of ordering the army of the Republic to march on Bavaria. Von Kahr and Hitler were in agreement, but von Kahr hesitated and failed to push the rebellion. On November 9th 1923, Hitler and Ludendorff were marching through Munich at the head of their comrades and fellow members through cheering crowds, when they were stopped by a cordon of police who fired upon them. The scene was one of the wildest panic, the street was strewn with dead and wounded, eighteen of Hitler’s comrades were killed, and Hitler was thrown down injuring his shoulder. At his trial he made a speech in which he unfolded his whole policy; a speech which made a great impression in Germany. “It is not you, Gentlemen”, — he told the Court — “who pass judgment on us. We shall be judged before the eternal bar of history.” He was condemned to five years imprisonment in the fortress of Landsberg, a sentence which was afterwards commuted to nine months, and was soon joined in prison by many of his followers who were allowed by the prison rules to mix together in the daytime. While there letters and presents poured in from all over Germany, but his organisation was rapidly falling to pieces without the presence of its leader. It was during his imprisonment that he dictated Mein Kampf to Hess. When he left prison in December 1924 he had come to the conclusion that a revolution based on a coup d’etat did not provide a permanent foundation on which to build a new state, and determined to undertake the colossal task of converting the whole German people and obtaining power by their votes. In spite of being forbidden to speak in several of the German federal states, his movement made rapid progress, and returned larger and larger numbers of members to the Reichstag at each election. One cannot read the story of Hitler’s early life without realising that everything went to form his mind for his future task. Consciously his ambition was to become a painter, but his early absorption in history and geography pointed in another direction. As a young boy, he came to realise what it meant to be separated from Germany, and to live in an Empire which is largely dominated by alien Slavonic influences. He read a history of the war of 1870 when he was a boy, and asked himself, why did we not go to the help of the Germans? The answer was plain. Because although we are Germans, we are divided from our blood brothers; the peoples would have joined, but the outside influence of rival dynasties kept them apart. Can we not see in this deep impression the reason behind his resolve to unite Austria and Germany, and his determination to bring the Sudeten Germans back to their fatherland? We have many impressions of Hitler from those who have known him personally, but perhaps the most interesting is the one given by his jailer. The relation of jailer and prisoner is naturally a difficult one, and yet he speaks of Hitler’s unfailing courtesy, and prompt recognition of the necessity for prison discipline. The jailer occasionally had difficulties with the young Nazis, who were indignant at their imprisonment, and chafed at prison rules. When trouble arose he had only to go to Hitler, who would say, “leave it to me”, and everything was put right. He speaks of his unfailing cheerfulness, how he encouraged his followers, and kept them interested to break the monotony of prison life, and of his invincible courage in spite of the apparent wreckage of his party. Instead of suppressing nationalities, the policy of the treaties which the League supported, he takes that deep emotion — love of country — and bends it to a new purpose, service to one’s own people and peace with one’s neighbours. It is nice to read about AH when written by contemporaries of his time before the hysteric filters of the jews were applied to him post-war. Imagine how inspiring the true story of this hard work, courage, faith, camaraderie, and triumph of the will would have been to hear as a child in school instead of all those stupid evil empty lies. Someday this treasure, along with the story of OUR own coming latter day eventual triumph of will, is going to be restored to the education and understanding of our children. To the eager understanding of shining ones who thirst for truth, and meaning, and their role in destiny. And through that gateway of understanding they will pass to explore vast fields of the history and accomplishments (and failures and lessons learned too), of our race, and finally in fullness turn about to face their own task, the next portion of the vast ascent of our people toward the ultimate. Nation is Race, Race is Nation is an ancient axiom, true today as it was a thousand years ago. It has nothing to do with hatred of other races but everything to do with love of one’s own race. Necessarily so, it becomes justifiable to hate and despise a particular alien race whose every action is directed toward the genocidal destruction of our White Race. Because they now control everything, politics, banking, education, entertainment, news media, it remains our task to break free from this Communist Pus permeating our minds daily. We can, we will do it!!! An interesting read that perfectly illustrates how victors write history. As Hitler is breathlessly systematically demonized in the most hysterical ways, as merely being open to questioning that well honed hysteric propaganda is now a criminal act in many places – the likes of Stalin, whose atrocities are exponentially higher than the alleged acts of Hitler, are glorified, emulated and celebrated by “our” leaders. Celebratory writings of the most destructive individuals to European and American society are a clear indication of who is the victor after all.